The Book of Samuel, which was written about 960 B.C., was later separated into Book 1 and Book 2, and continues thus to this day. The books of the Bible are explicated by our theology writers in custom written research papers. Samuel is one of the books that our writers will focus on if you are in need of a project exploring the elements of this Old Testament book. The Book of Samuel, which was written about 960 B.C., was later separated into Book 1 and Book 2, and continues thus to this day. It may be that the writings of the prophets Gad, Samuel, and Nathan were compiled in this book or that Samuel wrote the first twenty-five chapters and the other prophets completed the book. The Hebrew Bible considers I and 2 Samuel to be a single book with two volumes detailing Samuel’s life and career, the rule and decline of King Saul, and the rule of David. First Samuel tells the stories of the struggles of Samuel, Saul, and David and the development of Israel from tribes to a nation led by a king. 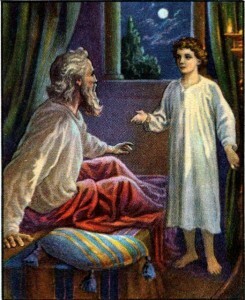 Samuel’s birth and call to the ministry are told in chapters 1 through 3. In chapters 4 through 7, the story of how the ark of the covenant is taken by the Philistines is told. The struggle for power between Saul and David recounted in chapters 16 through 31. Second Samuel is a description of David’s rein over Judah and Israel, including his military career and his joining together of his kingdom, to his failures in his roles as king and father. In his discussion of First and Second Samuel, Throntveit cautions that readings should be considered theological rather than historical, noting differences in each book concerning some information, but providing a view on the humanity of those in the Bible and how they reflect today’s humanity. Old Testament - Old Testament is considered by many an obsolete compilation of biblical history that has little bearing on Christianity today. Books Bible Judges - The Book of Judges provides insight into exactly what the title states: individuals who served as judges during Biblical times. Books Bible Romans - The Book of Romans was written by Paul the Apostle as a letter to the Church of Rome dated back to about 60 A.D.
Symbolism Bible - As one of the deepest and most profound pieces of literature, the Bible contains in its pages a number of critical symbols, taken from both the Old and New Testaments. Abraham - Abraham Research Papers explore the life of a religious man, that was the founder of monotheism, and patriarch of three religions Islam, Judaism, and Christianity. New Testament - The New Testament of the Bible is examined frequently in research papers in religion, theology, culture and even history courses at the college level. Kings and The Chronicles Research Papers examine two books of the bible and how they overlap. 12 Tribes of Israel research papers examine the Israelites from the Old Testament that are said to be the 12 descendants of the Patriarch Jacob. Paper Masters writes custom research papers on The Book of Samuel, which was written in 960 B.C.